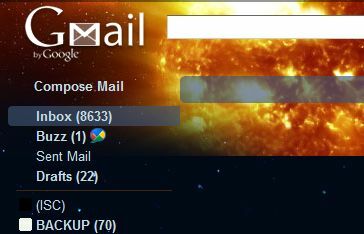 Are you tired of havinf numerous emails in your Gmail box and want to get rid of all the unread mail? I faced a similas situation and wanted to get rid of that bugging number which reminded me that how lazy I was or from how may useless places the emails came to me. So I decided to get rid of it and Googled how to do it. Got a post at Lifehacker that tells how to do it. I have added the screenshots too to the instructions at Lifehacker to make it easier for the not so savvy ones. Click Create Filter button, and you’re done. We all have more than one email address and I have several email addresses. It becomes very difficult to manage all of the address and keep on checking all off them one by one. 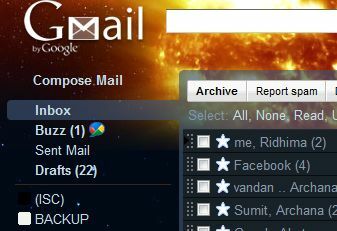 What I did with all was to add all email adresses to my gmail account and now I use my default gmail account to send and recieve email from any of the addresses. One glitch here is that not all email service providers allow you to forward the email for free. This is how to go about adding other email addresses. 2. Goto Settings [located on top right]. 3. In settings click “Accounts and Import”. There what you see is something like the picture down here. 4. 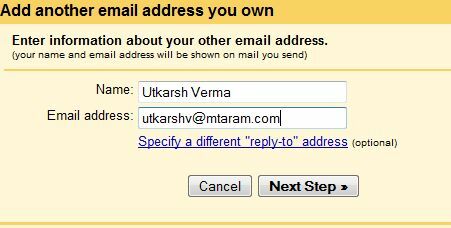 To add another email address click the button that says “Send emaul from another address”. 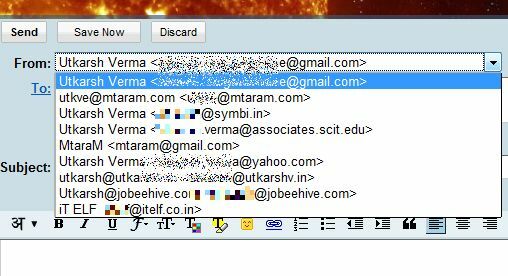 Here you can specify the mail server or use the gmail default. I recommend using the gmail server. Goto your other mail box that you specified and there you will find a verification link and code. Either you click the or copy the code and paste in the box and click verify. Then when ever you are in the compose window you get to select which address to send from via a drop down menu..
And you are done. This would allow you to send email from the all the addresses that you add to your gmail account. And in order to get the emails that come to your diferent mailboxes in this default gmail account you just need to configure the autoforward option. [yahoo and hotmail dont allow auto forward for free]. Gmail has long had keyboard shortcuts, though learning them can be difficult. Enter the Gboard, a specialized mini-keyboard for Google’s e-mail service. It debuts this Friday at an asking price of $19.99. The device is powered by USB and requires no special software or drivers, however users need to first enable keyboard shortcuts within Gmail’s settings before using it. Also worth noting is that it was created not by Google, but by Charlie Mason, a film producer from Venice, Calif. This is his first foray into the computer hardware business. The Gboard consists of 19 keys, all of which act as shortcuts within Google’s Gmail Web mail service. This really is a product that users will either love or hate. Those who have mastered Gmail’s shortcuts will see little need to buy special hardware and find a spare USB port to plug it into. Meanwhile, newbie users may be unwilling to take the plunge on such a specific peripheral for a program that works only within another program (the browser). The Gboard runs the risk of being an unappealing prospect to both parties. It’s also not the first attempt at easing the process of learning and remembering shortcuts. This time last year Google offered users a free pack of color-coded shortcut stickers that could be tacked onto any keyboard. There have also long been specialized keyboards for video and audio editing as well as graphical design–all of which provide similar, color-coded keys. Users who don’t want to commit, or tack stickers on their keyboard, also have the option of buying a silicone keyboard mat, though no such thing has been created for Gmail. Considering there are a total of 69 Gmail shortcuts (with more on the way if Google graduates some of its experimental features from its labs section) the Gboard could just be the first step toward creating a full-size (100 plus key) version. In the meantime, its early December release and low price tag make for a good stocking stuffer if you’ve got a Gmail lover in your family. • At $19.99 it’s not that expensive. Most numeric-only keyboards cost about the same.